Written and directed by Tom Cooper. Music by Brian James O'Sullivan. You probably never heard of the 1988 Piper Alpha oil rig disaster off the coast of Aberdeen, Scotland. It was the world's deadliest oil rig calamity. Occidental Petroleum, the American company which ran the North Sea oil platform with faulty maintenance and safety practices, is happy about that. It tried to bribe a painter who had been on the rig documenting the workers and their conditions. 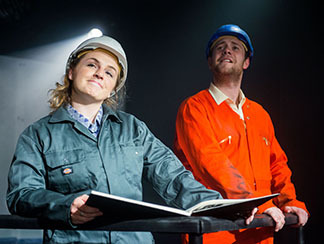 Coming on the 30th anniversary of the tragedy that killed 167 workers, that is the story of this play, written and directed by Tom Cooper based on interviews conducted by the Glasgow Bletherbox theater company. The music is a good collection of late 70s pop, Scottish music, and work songs. The story is of the moment. Charlaye Blair as The Artist, and Ross McKinnon as Jim. Photo by Tim Morozzo. Painter Sue Jane Taylor wanted to document the lives of workers. She got permission in 1987 for a week's visit to the Piper Alpha oil rig, the biggest platform in the North Sea. Portrayed by Charlaye Blair as The Artist, she is open faced, naïve, full of hope and enthusiasm. She puts on a gray protective suit, the men are in orange coveralls. We see her with workers who tell of their lives. A plumber, Jim (Ross McKinnon), soft and tough at the same time, deals with the fact there are 220 men and one shower and one toilet. Systems maintenance crews work on a platform which is aging. Jim says that says that the platform built for oil is now used for gas and is top heavy. The result is accidents, fires, gas leaks that you don't hear about on "the beach." No complaints or you get NRB, "not required back." Taylor remarks on the smell of chemicals from the oil. She returns to London and makes prints of the workers' photos. She books a showing of her exhibit of oil workers in Scotland. Brian James O'Sullivan as the oil company flack, with Charlaye Blair as The Artist. Photo by Tim Morozzo..
Then a loose valve on a gas pump is sent for repair. The new shift is not informed they can't use pipework that had a temporary cover and no safety valve. And the system is not shut down. (Occidental might lose profits.) She had remarked how the oil people were showing off new money and flashy cars. Gas leaks out under the platform and explodes into flames everywhere. The sprinkling system doesn't work. Life rafts don't inflate. Some workers jump, some make it to a safety vessel. Others wait in the dark for rescue. 167 men die. Collateral damage. Some 68 survive. So what does Occidental do? Apologize and promise to indemnify the workers and families and institute big safety changes? 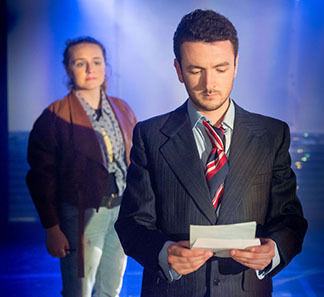 The play documents how an Occidental flack calls the artist to his office and attempts to bribe her to pull her exhibit. He says, "We don't think it's wise your exhibit should go ahead under the circumstance. We'll compensate you very generously." She says, "They're trying to buy my silence." She gets a lawyer write a letter to Occidental turning down the offer. The survivors and bereaved want the exhibit to remember them, and it opens. Later, a public inquiry documents the safety faislures. But Occidental is never charged or held accountable. Corporations rarely are. Killing people is a crime, except if it's done by a powerful corporation. Occidental sells its North Sea assets to the French company Elf, earning $640 million from the deal. Cooper's play, moving and vivid, is important to remind people of how corporations think they can buy people off. They couldn't buy the artist off. But they apparently had no problem buying off law enforcers who should have filed charges of manslaughter, at the least. How do you keep workers' history alive when most people don't want to read accounts of past sorrows and struggles? One way is through theater. This play is soft, not didactic, but its quietness has an effect. Excellently performed by the cast and smoothly directed by Cooper, it's a good addition to the theater of labor.